ENDOX® Dry Antioxidants are formulated specifically for the treatment of finished feeds and premixes. Each ENDOX product is a combination of an inert carrier coated with a synergistic blend of synthetic antioxidants, metal chelators and surfactants, which adequately distribute to protect feed from fat oxidation, vitamin degradation and more. Synthetic antioxidants like butylated hydroxyanisole (BHA), butylated hydroxytoluene (BHT) and ethoxyquin (EQ) are commonly used to provide oxidative stability to fats, vitamins and other nutrients in finished feeds. Conventional antioxidant mixtures for feeds are often simple, dry mixtures containing crystals of the antioxidants and carriers. In contrast, ENDOX Dry Antioxidants are manufactured using a proprietary process where active antioxidants are applied to the surface of a dry carrier. This ensures nearly every particle is covered with an active mixture and allows for the homogenous distribution of the antioxidants throughout the feed or premix. ENDOX products contain research-backed blends of antioxidants specifically developed by Kemin scientists for protection of finished feeds or vitamin/trace mineral (VTM) premixes. *Inclusion rate based on 3% fat diet. Vitamins are essential for animal growth, health, reproduction and performance. Factors such as temperature, oxygen, light and catalysts can all negatively impact vitamin stability in feed. 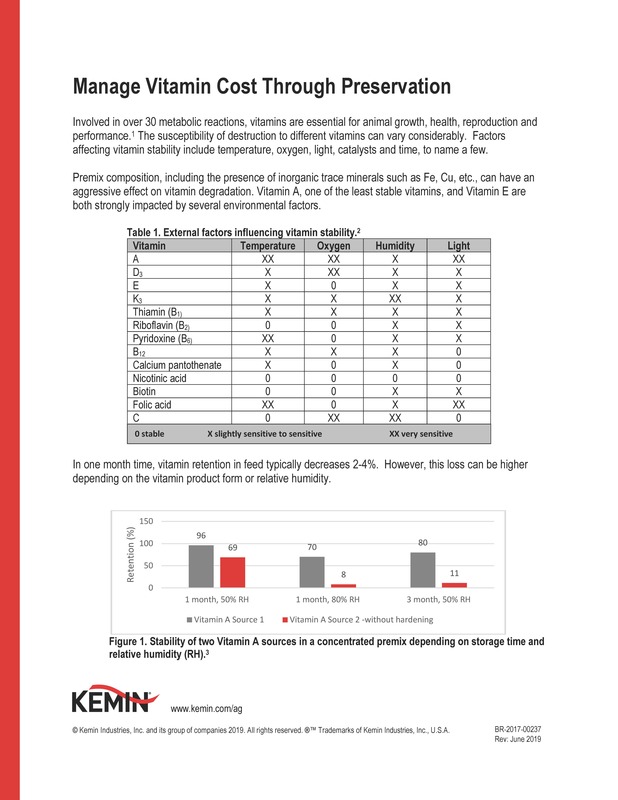 Premix composition, including the presence of inorganic trace minerals such as Fe, Cu, etc., can increase susceptibility of vitamins to degradation. Preservation of vitamins in the feed matrix can be accomplished through the addition of an antioxidant. For the best vitamin protection, an antioxidant system like ENDOX, which includes a blend of oxygen and free radical scavenging antioxidants and metal chelators, should be used. To see why ENDOX is the right choice for preserving vitamins in complete feeds and premixes, click here.